Under what circumstances did your pain begin? 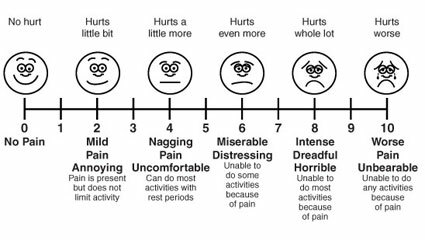 Currently, what is your pain score? What is the highest your pain score that you have ever had? What is the lowest pain score that you have ever had? When did you first notice your pain? Any abnormal vaginal / breast discharge? What pain medications have you tried in the past for your pain? Please list all and explain why you no longer taking them. If working less than full time is pain the reason? If you had no pain would you return to work? Has your employer been helpful and understanding of your problem? What would you hope to be the end result of this evaluation? If you are treated here, what are the results you HOPE for? If you are treated here, what are the results you EXPECT? Accepted file types: doc, docx, pdf, txt, zip, jpeg, jpg, png, xls, xlsx.